Deportation is always a common problem for alien criminal defendants in Miami and other parts of Florida who a convicted of a crime. In U.S. v. Figueroa-Sanchez, the 11th Circuit faced two issues: 1) whether the district court properly denied defendant’s 2255 motion for federal habeas post-conviction relief as successive, and 2) whether Padilla v. Kentucky, 130 S.Ct. 1473 (2010) announced a retroactively new rule of law. Deportation is always a problem for an alien defendant convicted of a crime. The Supreme Court’s decision in Padilla v. Kentucky offered habeas relief to defendants who were not advised of the deportation consequence prior to entering a plea. Figueroa-Sanchez was a citizen of the Dominican Republic who lived in the U.S. since 1972. 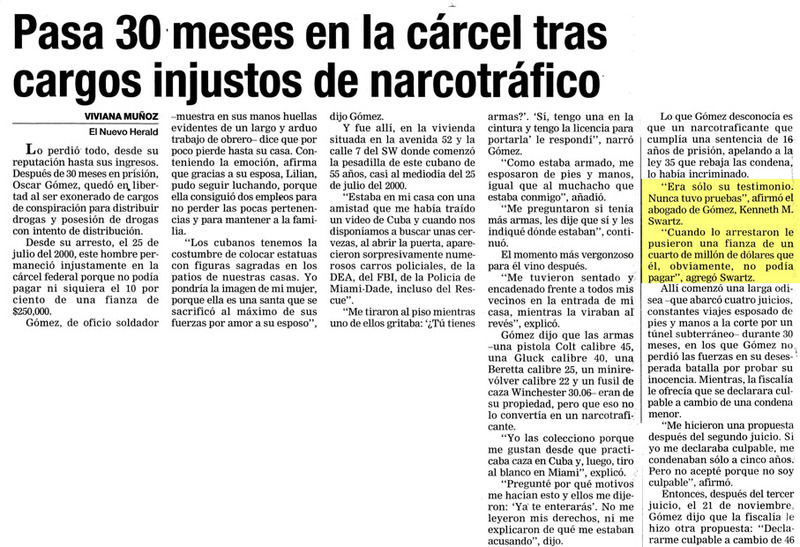 After his drug trafficking conviction in April of 2004, he faced deportation. In July of 2008, he filed a pro se motion to vacate judgment pursuant to Rule 60(b) Federal Rules of Civil Procedure. The district court treated this motion as a §2255 motion, and then denied it as time barred because it was filed over one year after the judgment became final in 2004. Two years later, he filed a 2255 motion to vacate his conviction based on Padilla because his counsel failed to inform him of the risk of deportation before pleading guilty. The district court dismissed for lack of jurisdiction, noting that it had construed the July 2008 motion as a 2255 motion, and therefore the Padilla motion to vacate was successive. The 11th Circuit decided it was not successive because the district court failed to give the defendant the warnings required by Castro v. United States 124 S.Ct. 786 (2003) when it recharacterized the defendant’s Rule 60(b) motion. Castro held that a district court must take the following steps to assure that the defendant is aware the motion is being recharacterized as a 2255 motion: 1) advise the litigant of the recharacterization; 2) warn the litigant he will be restricted in any subsequent 2255 motions, and 3) give the litigant an opportunity to withdraw the motion. Because the district court did not follow Castro, the 11th Circuit held that this motion could not be dismissed as successive. Unfortunately for Figuero, the 11th Circuit held that Padilla could not retroactively apply as a basis for the defendant to vacate his conviction. Section 2255 grants an additional one year for petitioners to file a 2255 motion from the date on which the right asserted was initially recognized by the Supreme Court so long as the decision is retroactively applicable to cases on collateral review. The 11th Circuit held that Padilla was not retroactive. Though Padilla announced a new rule of constitutional law, it did not announce a watershed rule of criminal procedure nor did it alter any bedrock of criminal proceedings. Even if a defendant demonstrates constitutionally deficient representation under Padilla, a petitioner must still prove prejudice under Strickland v. Washington. “In order to show prejudice, a petitioner must show that there is a reasonable probability that, but for counsel’s errors, he would not have pleaded guilty and would have insisted on going to trial.” The 11th Circuit found Figueroa-Sanchez cannot show prejudice required by Strickland.